The big screen that fits in your hand. Infinity Display. Even watching movies is simply more enjoyable with the Infinity Display's 18.5:9 aspect ratio. 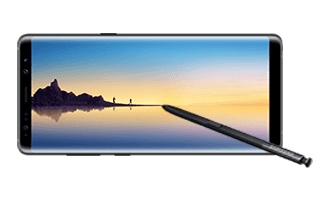 In landscape mode, the Galaxy Note8 offers a 14% wider viewing area that makes for a richer, more immersive experience that pulls you in wherever you are. *14% wider viewing area compared to Galaxy Note5. The Galaxy Note8 is designed for you to use with ease and simplicity. The beautiful curves and seamless body are engineered to offer you a comfortable grip and more space for you to write freely with the S Pen. The fingerprint scanner is virtually flush with the back, and the Home button is embedded underneath the Infinity Display to stay invisible until you need it. It's the beginning of a seamless experience. The 18.5:9 aspect ratio was made for multitasking. Turn on Multi Window mode to have two apps open at the same time. And for those two apps that you use together, App Pairing presets let you open them simultaneously with a tap. Now it's simpler than ever to listen to music as you find your way or read reviews as you shop. Whether you're going through your social media feed or writing a recipe in Samsung Notes, you see more and do more with less scrolling on the tall 18.5:9 display ratio.